One of the best things about summer are the variety of fresh tomatoes that are available at the food markets right now. My favorite tomato is the local Beefsteak tomato. The may look ugly but the taste is rich and flavorful. I can’t get enough of them so I eat tomatoes almost every day, preferably with just a simple vinaigrette on a slice of homemade sourdough bread topped with mozzarella. The tomatoes are also great in a watermelon salad with feta cheese. Another of my recent favorites is a tomato salad with red onions, celery and middle eastern string cheese. The string cheese is often spiced with black cumin (Nigella sativa) which gives this pleasant cheese an interesting flavor. As an appetizer, a fresh tomato salsa, spiced with cilantro, chili and garlic is never wrong. If I’m starving and too lazy in the summer heat I turn pretty much the same thing into a cool tomato sauce for pasta. Wash the tomatoes and chop them into smaller pieces. Chop the onion and the chili (adjust the strength to your own liking) into tiny tiny bits and pieces. Rinse the basil and chop the leaves roughly. Place all the prepared ingredients in a bowl and squeeze in 1-2 garlic cloves. Mix together vinegar, olive oil and mustard. Season with lime juice, salt & pepper. If you like you can also add some honey to the dressing but if you are using a sweeter mustard that may not be necessary. Serve this cold tomato sauce on your favorite pasta topped with freshly grated parmesan and toasted sunflower seeds. * It works perfectly well with other kinds of vinegar such as balsamic, apple cider or white whine vinegar. 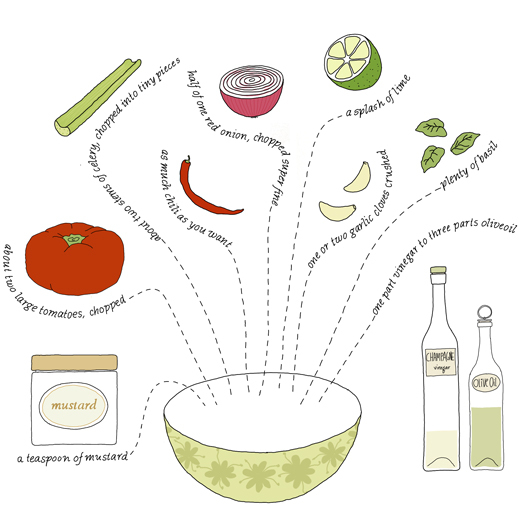 I love the idea of pasta sauce with lime, mustard, and vinegar! But I’m unclear on one of the steps. You say “squeeze in 1-2 garlic cloves”–does this imply that it should have been roasted until soft, beforehand? Or should this garlic be raw and minced, or simply whole cloves plopped in (and then picked out later)? The garlic should be minced or “squeezed” in with a garlic press. As this is not a cooked pasta sauce the garlic should be raw.